This might turn into a series. I could have Iliad-withdrawal. I have so much to say about the epic that my mind seems to come up with fuzzy nothings about all other books lately. Maybe I should give up trying to write anything other than the delighted swooning ramblings brought on by my successful (yes, it still surprises me) reading of The Iliad. Disclaimer: In all honesty, I haven't even glanced at the thousands of literary analyses out there that would surely help me understand the poem better. I should perhaps do that, but I only want other opinions once I'm done processing mine - and God knows when that will be. For the first time in a long time, I find myself blogging for me, and not for the reader. I'm writing to feed the pressing need to express. So, of course, I will end up saying things that are in-your-face obvious and I hope this little disclaimer of mine will keep you from rolling your eyes and going, "geez, everyone knows that." For me, one of the biggest curiosities of The Iliad is the deaths. There are hundreds, but they all go about in this pattern. The character who is about to be killed advances towards the killer, the poet tells us all about his life - where he is from, how he was raised, how he ended up fighting for the Dardans (Trojans) or the Danaans (Greeks). And then, all of a sudden, he is hit, by a spear through his neck or an arrow through his chest, gut-dropping and blood-spillage follows and we are told simply that "darkness clouded his eyes." It's interesting how many stories we get to know as they come to an end. It's also mad, devilish to introduce lives just on the brink of the end. Has to mean something. An English professor I became acquainted with this summer showed obvious indifference when I, with characteristic ineptitude, bragged to him about reading The Iliad. He compared it with the Mahabharata and provided insight into the latter which he considered more profound. I haven't read the Mahabharata, but in all fairness, it's about ten times the size of The Iliad; it has much more room to be more. He commented that The Iliad was little more than a gory massacre. Too sensationalized, he called it, and wrinkled his nose. I couldn't disagree more, but I get where he's coming from. If there's one thing The Iliad lets us know, it's that the gods have all the power. Destiny is already fixed. Hector must die, Troy will fall, but so will Achilles, who will be immortalized for his lion-hearted bravery. But this does not stop the Trojans from hitting back, the Achaeans from worrying and Achilles from simply refusing to fight. The gods don't just have favourites, they meddle. Athena in disguise tricks Hector, Aphrodite whisks away her son from the battleground and Hera with her ivory arms fights with Zeus about being partial. The gods have their whims and the war rages on. It's mindless. Men are puppets who pray, sacrifice and kill to please. There's no thought in it, really, no genius, no Krishna with his war strategies. The Iliad is essentially about a man and his big hurt ego, Achilles and his stubborn thoughtless rage and how it changed the lives of nations. But is it any less meaningful? I think The Iliad drives home the message that control is a myth, so you might as well believe in whatever you believe in, because all you can ever be sure of is faith. I know that seems like a given, but who did tell you that the truth had to be more than simple? What sounds like a fluttering resignation can be a gracious acceptance. The Achaeans attack and the Trojans fight back, their fates sealed, because the ending is inevitable and all there's left is shaping the middle - that is life. The deaths in The Iliad aren't meaningless precisely because the poet makes it a point to tell us, even if a little, about every life he takes away. 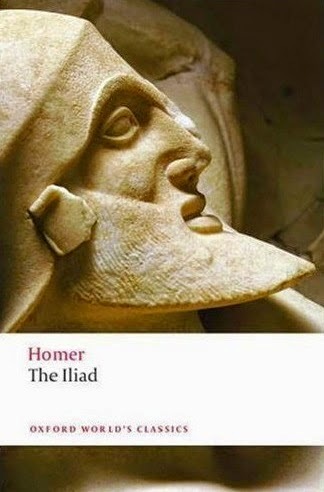 The war-deaths in The Iliad are only as meaningless as all death. It's pointless, the poem has made me realize, to try and find that meaning in an ending which can be found in a life. Spoilers (Edit: I earned much amusement for putting a spoiler alert for the Iliad; still, read at your own risk:) I have stuck to the professor-prompted musings on individual deaths here. In a larger sense, death is the main theme of the Iliad. For Achilles, as for Hector, death is inevitable. For Achilles, the very purpose of whose life is ensuring immortal recognition, death is glory. For Hector, death is significant because the time leading up to his provides a fighting chance for Troy. It is death that brings Achilles out of his silence. 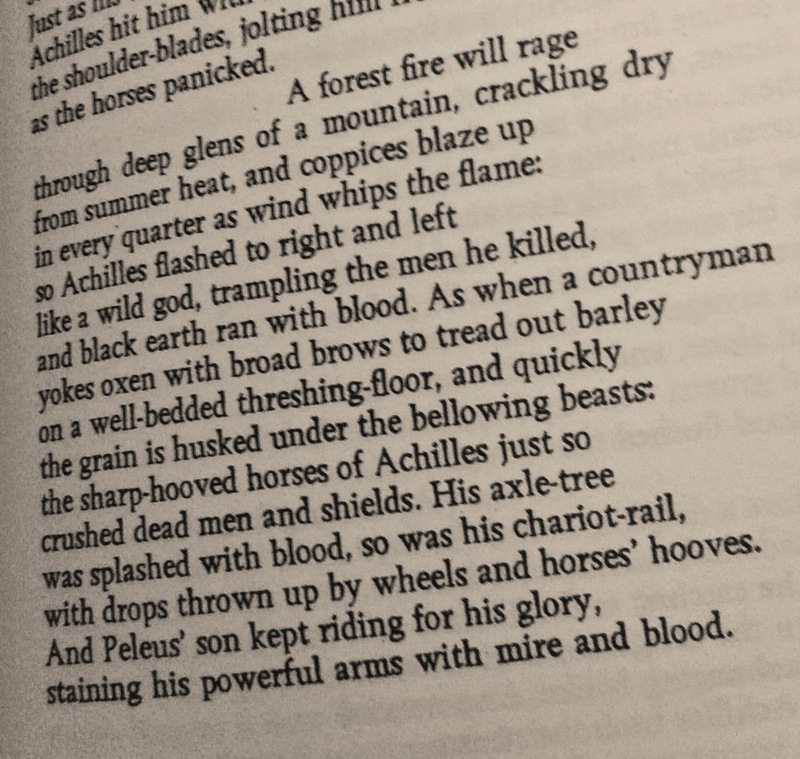 The death of Patroclus, his friend, unleashes the monster that we've only heard of since the beginning of the epic poem when Achilles leaves the fight. It is also death, Hector's, that eventually shows a glimmer of humanity in the cruellest of men. The Iliad ends on a sad, albeit almost hopeful note, chronicling the momentary, eleven-day, truce that Achilles agrees to upon seeing a broken King Priam beg for his son's corpse. A long chapter about the games after the long-awaited burial of Patroclus is followed by the most beautiful ending ever, the best part of the epic, for me. Achilles was meant to kill Hector, though he couldn't have known how or why. I think a part of him, the part that knows love and buries Patroclus in elaborate festivities, agrees that for all the passion and rigours of war, the dead and their survivors deserve respect. For trying. I spent this entire morning snuggled up in bed reading the final fifty pages of The Iliad, aloud, to myself, because out loud is the only way the book should be read, trust me on this. The blog has been in a slump through December and I can't think of a better way to revive it than by sharing impromptu musings on my new-found respect for translators and a glimpse at the best reading experience of my life - yes, that's what it's been. It's The. Effing. Iliad. In all honesty, a part of me wanted to read The Iliad for the same reason you'd want to read Proust - so I could say I've read it. I was looking at attending university, studying literature and hardly well versed as I am in classics, I thought being legitimately able to insert "When I read the Iliad..." into conversation would tip the scales in my favour. Of course, that was only one reason. Another was just trying my hand at reading an epic. I chose The Iliad because it was a History Channel film on Helen of Troy I'd seen as a kid that had first sparked my interest, if a dull spark back then, in mythology. "Fitzgerald has solved virtually every problem that has plagued translators of Homer. The narrative runs, the dialogue speaks, the military action is clear, and the repetitive epithets become useful texts rather than exotic relics." I won't get into what I thought of the epic. It is still far too fresh in my mind for that. But reading this book has completely made me question an initial unthinking stance on translators and here's why. Homer is not easy and Fitzgerald just plays with words. The writing is beautiful and I cannot stress enough how smoothly the writing flows, how rhythmic it is; how deceptively with-ease he makes rhymes. It retains the conversational-recital tone of the epic, and it can be experienced, as is appropriate, without academic help. Reading The Iliad made me realize and accept the very critical and influential role of a translator in literature. Not as the commonly described "bridge between reader and writer," which attempts to sound all profound but is basically a definition of the job. A translator is an interpreter and giver of new / deeper meaning. A good translator should peel back the layers of a narrative, maintaining or adding aesthetic quality, sure, but mostly - making a text more accessible to his intended audience. And that is something that I never thought about before, the simple idea that a translator may have his own intended reader that might not be the same as the writer's. Translation is maybe not a strict replacing meaning-for-meaning work that has everything to do with language. Taking focused liberties with a piece could make a great translator out of a good one. I've come to realize recently that I think as I write which makes me often end up in winding lanes of thought and incomplete corners. But that's how I am. So, I'll leave this characteristic half-formed idea with a far more coherent comment (which I hope it's okay to repost) by a fellow blogger, Viktoria, on my review of Translator Translated by Anita Desai. I have noticed when it comes to poetry that they like to use the word interpretation instead of translation. Which makes sense. I really think of all translation as interpretation, and come to think of it, I think the act of reading, whether across language borders or not, is interpretation. I have been in enough book discussion groups to know that my reading can differ a whole lot from my neighbours reading. Actually, I think what makes literature great is its capacity to contain and express my own experiences. It´s like writing is the art of embracing and affirming every potential reader. So, I would argue, there is an art to reading that is kin to the art of translating. Its mother, perhaps. Something to chew on. I'll post more on reading The Iliad later. It's good to be back. After the Mahabharata Secret, Christopher C. Doyle yet again explores the science behind the enduring mythology of the Mahabharata and brings it alive in a contemporary setting. The result is a gripping story that will keep you hooked right until the last page. My thoughts: This haphazard non-review has been languishing in my drafts for weeks past the deadline. I apologize for that. When The Mahabharata Quest arrived for review, I found myself skimming through the cover blurb and the author introduction. The acknowledgments begin, "This book owes its existence to many people without whom it would never have been written," and the clumsy redundancy made me smile. The writer's bio boasts of mentors of the likes of Heinlein, Asimov, Tolkien and Wells. Way to build up expectations! The Mahabharata Quest is confusingly and predictably the first of a series. The lead characters of The Mahabharata Secret do return, Colin and Imraan and Vijay Singh, of course, and others. I think the author has done a good job of reintroducing the characters and back story without making it confusing for someone who directly reads this book. Even the new characters, like Alice, are interesting once you get to know them. An issue that I had with the first book persists, the dialogue is clumsily unrealistic and no person in the book has a distinctive voice. Colin might as well be from Delhi. A lot of the book is told, not shown, and this flaw is most obvious in its characters. They all behave the same, to an extent, and say much the same things. I like the riddles and clues and how the group solves them, even those that aren't well articulated. It's historical fiction, and if there's one thing historical fiction thrives on, it's research. I've always felt that a well researched novel is one that manages to blend the information into the story. Information dumps are most distasteful. Less is more, right? The Mahabharata Quest suffers from pompous show-off-ery, and the author doesn't seem to get enough of basking in the glory of all the effort he's put into the book. A glossary or section of references would have been nice. But all the maps are just an unnecessary distraction. The blurb promises thrills and it does deliver on that front. It kept me hooked, and I surprised myself by how willing I was to ignore the awkward phrasing and read further, eager to find out what happened next. So, believe me when I say, I could have ignored the aforementioned annoyances and the fact that the ending was a little anticlimactic, had it not been for the unresolved threads. Leaving loose strands of story to be tied together in the sequel is the worst form of manipulation to ensure future readers. It's just lazy. Remember back when writing a book was a big deal? Now, we regularly find authors making money churning out books in incorrigible patterns. This is not to imply that said books are badly written. I do think that The Mahabharata Quest is a good book. I read its predecessor, The Mahabharata Secret, only weeks ago. It was recommended to me by a friend, and in times of the sort of boredom that precedes college exams, it made an exciting read. 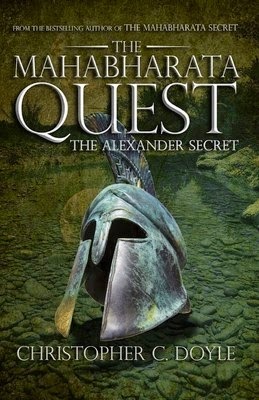 To occasional readers, The Mahabharata Quest - The Alexander Secret will surely be the gripping story that it promises to be. But let's just call the author India's Dan Brown, because I can't for the life of me name one thing that made this book distinctly more memorable than all the books out there or significantly different from his first. So it's not a bad book, but the fact that I can't think of anyone I'd recommend it to should say something.